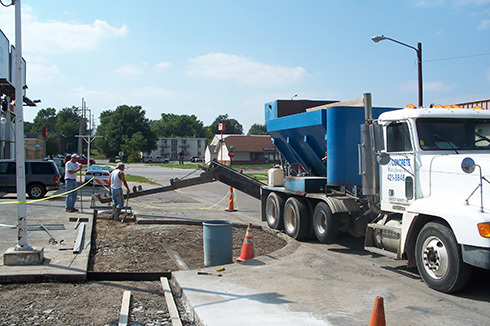 CS Concrete provides on-site mixed and metered concrete for residential, commercial, and industrial jobs. Our on-site mixing allows you to eliminate waste and only order the concrete that you need. Why pay for what you ordered when you can pay for what you use? We are a locally owned and operated business that provides personal attention to our customers. We offer flexible hours for your convenience and can even do Saturday deliveries. While we are not contractors, we will be happy to refer you to a local contractor for your project. Whether you are looking for concrete work, engineered blocks, or fiber reinforcing, we are happy to assist you. With 20 years of experience, we are pioneers in our industry looking to change the way that you purchase concrete. Our concrete is always fresh and mixed at the job site. We appreciate your interest in visiting our website and look forward to serving your concrete needs. Call us today for more information on pricing inquiries.